From my earliest programming days, I've been writing Adventure games. In the decade from 1980 to 1990, I started more than twenty, although I have done much less since then - I guess this is a downside to programming for a living. This document is a more or less exhaustive list of all the Adventure games I've written, in chronological order. Around 1980, my friend Myles Kelvin was lucky enough to get access to a computer - his dad bought it to do accounts on. We played Scott Adams' Adventureland, and were impressed enough to want to do something similar ourselves. So we wrote a bunch of DATA statements in TRS-80 level 2 BASIC. They contained text to describe dragons, castles etc., though we didn't have any clear idea of what we would do with them. The answer eventually turned out to be: nothing. I extended this in small ways - for example, by explicitly placing a small number of ``treasures'' in difficult-to-reach places. Three or four more or less identical games arranged in a solid 3D grid (3x3x4, as I remember), with very primitive navigation facilities and perhaps no other verbs at all. In retrospect, the 3D layout was obviously a blind alley - I think I had been led there by the clear physical framework of the infinite maze. This was my first ``real'' adventure game, co-written with Myles on his dad's 48k Video Genie (a TRS-80 clone). The Dracula theme was probably inspired by the knowledge of Scott Adams' game The Count, though neither of us had actually played it at the time. L$(), D$() and H$() contained location descriptions, directions (exits) and a help-string appropriate to the location. The ``direction'' string was a glued-together sequence of two-digit location-numbers reached by going in the direction North, South, East, West, Up or Down in that order, with ``no exit'' represented as location zero: so the exit North leading to location 4 and West leading to location 24 would be represented by the string ``04000024''. This seemed like a good idea at the time, and the idea of hitting the 100 location limit was laughable! O$() and N$() contained object descriptions and names (three-character unique prefixes). Nouns were recognised by means of code like ``mid$(n$,1,3)="doo"'' - the refinement of finding an object-number and comparing against that came much later! I can't believe I wrote some of this stuff. P() contained the objects' positions (location numbers, with the special value of -1 for ``carried''), and F() contained a flag, whose initial meaning was TRUE for objects that can be carried, FALSE for others, but which got expanded to all sorts of values other than zero and one, to represent specific states of specific objects. Also co-written with Myles, this much larger game was inspired by adverts for Zork: we'd never seen the game, or ever read a review, just a full-page advert for Zork as resold by Molimerx software! We were so impressed with details of the huge size (as it then was) and such novel concepts as storing part of the game on disk, that we decided to try to emulate it. Zonk, as it was originally called, read location data and bitmapped graphics from fixed-length records in a random access disk file. The fixed length was marginally over 1k, and the bitmaps were able to fit comfortably in this space, since they were monchrome 128x48! (Actually, the TRS-80 had a 64x16 screen, and among the characters in its 8-bit-wide set are the 64 possible combinations of six on/off blocks packed into a character space, two across and three down. This means that the bitmaps contained text and pictures built from puncuation characters as well as the bitmap stuff). It being the early 80s when floppy disks were a dangerously exciting novelty, we had to write a bespoke program for creating the disk-file with the locations. And of course we needed a bespoke image-editing program too. In addition to the ``real'' loctions, Sarg included a 125-location 3D maze (5x5x5), implemented as a basically separate program embedded in the main one. It was called ``The Maze of Arnold F. W.'', a very cryptic bow in the direction of Pink Floyd's Final Cut album which we were listening to a lot at the time - this gives a rough dating of the game. At the time, we were very proud of Zonk. This just shows what you can get away with by means of never having played the real Zork. This was a substantially enhanced re-working of the Practical Computing infinite maze for an unexpanded VIC-20, with monsters to fight, treasure to find, etc. It's mostly interesting because it was the first program to earn me any money - thirty pounds or so for publication as a listing in the back of Your Computer. There's a good chance that I still have the pages with the listing on, somewhere, but I can't imagine where. If I ever find it, I'll put it up on this web site. The guys at the magazine hadn't told me they were going to use my program, so when I saw it in the magazine, I didn't immediately recognise it as mine - I thought to myself, ``this seems like a good game, I think I'll type it in''! Ah, the thrill of sudden realisation! This was a partial reimplementation of Scott Adams' Adventureland, which I did to check that my system was sufficiently powerful to express all the sorts of things I needed to be able to say for my own games. I don't think I bothered finishing it. This was the first ``real'' Adventure that I had published. It's described in much more detail in its own section. My follow-up to Magic Mirror, described in much more detail in its own section. This was intended to be number three in the Magic Mirror series, but although I finished it, it never got published somehow. Probably named after the Black Sabbath song (this is the sort of stuff I was into in those days), it was intended to be the most difficult of the sequence, with one innocent mistake early on preventing completion at a much later stage. Number four in the series, and named after another Blue Oyster Cult song, this was all about getting as high up as possible, climbing beanstalks, ladders and all sorts. I can't remember much more about it now, and it too was never published. The four games in the Magic Mirror series were all written very close together, in a matter of a few months. I had my game mechanics all worked out, and I was on a roll with the plotting. I wish I could remember now why they didn't make it out there into the hands of the public - the way I remember it, it just sort of never happened, which I think is a real loss. Apart from anything else, it means that I've lost whatever chance I might once have had of playing these lost games again. This was the last complete ``straight'' adventure game I wrote, and I guess I probably had this in mind when I called it The Final Challenge. It was very much in the mould of Magic Mirror et al., and was intended to cap the series, though as far as I remember, Terminal Software never even got to see it. Of all my games that have been lost to posterity, this is the one that I would most like a chance to play again. I remember it somehow being invested with a strong sense of atmosphere, and having more-interesting-than-average puzzles. I have often tried to recapture elements of the plot to Cornucopia, as it rather bizzarrely ended up being called, but I have never succeeded to my own satisfaction. I particularly remember a tricky initial portion, necessary to get into the caves where the game took place, and a huge underground cavern with trees growing in it. About this stage, I invented Lords of Midnight - in particular, the technique known as ``landscaping'', whereby graphics illustrating the various locations are generated on the fly, on the basis of a semantic notion of the sourrounding objects. Unfortunately, Mike Singleton rushed out his version while mine was still at the chemist's, and made four million pounds more than me - just like Alfred Hitchcock's remake of Mr. L. F. Dibley's film, Rear Window. This was the biggest thing I did commercially. I believe it was the first (only?) multi-player adventure for the Commodore 64, though this had to be achieved by the players taking turns. In all honesty, I doubt anyone really played it like that, but it was a good single-player adventure anyway. There's much, much more about CoC on the Causes of Chaos section of this site. This was to have been the follow-up to Causes of Chaos - a multi-user adventure game based on the Arthurian mythos, with a whole bunch of new features over and above CoC. In particular, a range of characters were available: Arthur, Lancelot, Galahad, etc. ; and they each had their own particular abilities: Arthur's leadership, Lancelot's strength, Galahad's purity, etc. Players could assume the role of any character not already being used by another player, so that even a single player could dispatch the various characters to different tasks simultaneously. In retrospect, this is a somewhat Lords of Midnight-ish notion, though I didn't have that in mind at the time. Technically, this was a small step forwards from Causes of Chaos, in that I started to formalise the separate notions of players and characters, and consequently to think in more abstract terms. Only a small step, though. I also wrote a lot of stuff to do a limited form of graphical combat (based primarily on reaction speed), and got as far as coding up the first twenty or so locations of the game, with their objects and some puzzles. The game foundered not for technical reasons, but simply because I lost momentum on designing the game's plot: the ideas just wouldn't come, probably because of the limitations of Arthurian Britain. This is a shame because (A) I would have made a lot of money, and (B) I had some good ``grand scheme'' ideas for the plot - in particular, that it would not be possible to win the final battle: Arthur always loses, in the manner of a Grand Tragedy. The Camelot introductory screen was a lot prettier than the Causes of Chaos one: in particular, I was able to design separate Olde English sprites for each of the letters of the word CAMELOT, and slide them on to the screen one at a time, which was a very nice effect. There were vague plans to make a loading screen by videoing the members of the church I was then a member of, dressed up as knights, and digitising the result - this gives a rough date for the game, since I must have been seventeen or so. At about this time, I took some time out from my more ``serious'' adventure programming; and I hadn't had so much fun in ages. Ian ``Zobbo'' Cottee and I wrote this game together, at his house, using Gilsoft's Quill, as a sort of a ``B-side'' to his altogether more serious, though still rather silly, Zob. Borrowing thematically from Graham Chapman's colonel character (``Silly, silly, far too silly! ''), packed with wardrobes, custard and Van der Waals forces, the entire game was so linear that it was virtually impossible to fail to solve it. But what fun. After all these years, wardrobes survive as a major thematic force in my game design. I wrote this at home - don't know why I bothered really, I guess I just enjoyed the ease of Quilling rather than programming for a change. It was set in the far future in a devastated post-holocaust earth, and involved time travel, done by means of a time machine in a museum: a strange coincidence, since I had never played Zork III at that stage. Since this involved no programming, and I never finished plotting, this didn't really add much to my portfolio. That was enough with the Quill already! I went back to the more flexible and powerful system I'd used for Magic Mirror as suchlike, to write Crystal of Chaos. This was interesting only from a plotting point of view. While it did nothing new technically - indeed, it was a backwards step from Causes of Chaos and Camelot - it added new elements such as magic (in a book of spells), and had more than one possible solution to most of the puzzles. This meant that it would be possible to get quite a long way into the game, only to find a puzzle that couldn't be solved because the necessary objects had been ``used up'' in solving earlier puzzles in a non-optimal way. Interesting that here, as in other games, I unwittingly paralleled work done by Infocom: the spell book and multiple solutions were both to be found in the Enchanter/Sorcerer/Spellbreaker series. I guess all good ideas are obvious ideas in the end. By this point, I'd realised that the whole multi-player thing was a red herring while I was working on single-user computers (how did it take me so long?! ), so I shelved that whole line of work until such time as I had access to multi-user computers. In the mean time, I decided with Zonk to concentrate on using the C64's capabilities more fully, and on playability. This meant that in programming terms, there were more new ideas here than in most of my games. One detail was that I built infrastructure that allowed me to use all 64k of the 64's RAM, by storing text in the 16k that's ``hidden'' behind the kernal and BASIC ROMs, swapping the necessary blocks in and out as necessary with little machine code routines. A more significant change was that I finally broke away from the old two-word ``VERB NOUN'' input format, allowing multiple-word noun clauses; and there was a certain amount of intelligence in understanding what the player intended. For example, the game included (among other things) a stone key, a bronze key, and a bronze statue. If you said ``GET KEY'' when both were present, the game would ask which you meant, so that you had to say ``GET BRONZE KEY'' - or just ``GET BRONZE'' for short, although of course that would also be ambiguous if the bronze statue was also present. But if you were carrying one key and the other was present, then ``GET KEY'' would do the right thing. And ``DROP KEY'' would do the opposite, but also right, thing. Cool. One other innovation (for me - good games had been doing it for years) was the introduction of what I termed ``abstract objects'' - things like ``self'', ``air'', ``ground'', etc., which are always there. By 1987, I'd written about twenty adventure games in BASIC, all of them limited to varying degrees by the linearity of my data structures, which were basically parallel arrays. 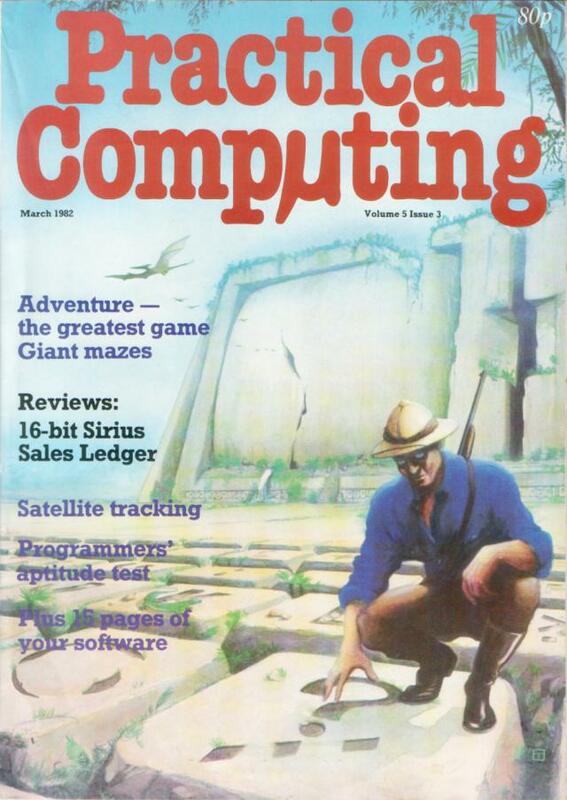 By then, I was at Warwick University, and I'd finally learned another programming language - C. Armed with C, and a bit of understanding of data structures other than arrays - and inspired by having read Richard Bartle's columns about MUD in Micro Adventurer magazine - I set out to build a much more ambitious game that anything I'd done before. The big advances in what I was trying to achieve here were twofold. Firstly, I wanted to represent hierarchies of objects: for example, the herring is in the glass case, which is in the wooden box, which is at the forest clearing. And secondly, I wanted to build a ``real'' parser for the English language, using a formal BNF grammar expressed in yacc. So I didn't get very far with adv (about two thousand lines of code) before I threw it all away and started again on what would become MUNDI. Fortunately for my own sense of history, I had the sense to archive what I'd done up to that point, and this distribution is essentially that archive. When I started thinking about how I could re-jig adv to work with multiple users, I quickly realised that the source was totally unsuitable, and that I'd do better to start again. What emerged was a new program, initially called simply MU (for ``Multi-User'') but quickly renamed MUNDI which has all sorts of meanings. For much, much more about MUNDI, see the MUNDI section of my site. ### - write this up! I have an embronic Herring section. This is a very simple system for writing simple adventure games in the Scott Adams TRS-80 format, which can be run using ScottFree and similar interpreters. Download links and documentation are in the sac section. At the last count, that's more than 20 adventure games I have been involved in. Most of them I have designed and written myself, one or two have been co-written, and a few have never reached the degree of completion that merits the word ``written''. Still. It's plenty, isn't it?